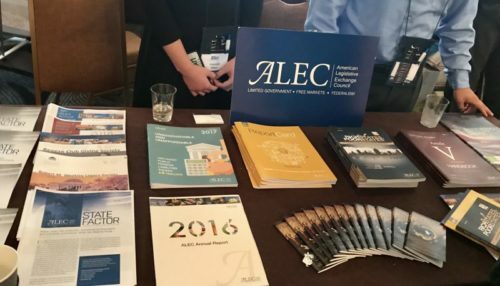 Theoretically, the American Legislative Exchange Council (ALEC) is group that brings together businesses and legislators to promote corporate-friendly policies. In practice, the group regularly wanders far afield, making it indistinguishable from any other right-wing organizaton. So it’s no surprise that ALEC just showed up to support a religious right convention. Moreover, the group is putting its clout behind religious liberty exemptions that would gut existing nondiscrimination protections for LGBTQ people. ALEC had a booth last week at the Road to Majority Conference, sponsored by Ralph Reed’s Faith & Freedom Coalition. The coalition and Reed have a long history of opposing LGBTQ rights. President Trump spoke at the group’s convention last year, promising to protect its agenda. ALEC has long been closely aligned with the GOP. The legislators that participate in it are overwhelming Republican. So it’s not surprising that the group not only promotes corporate-friendly policies but also culture war battles, like religious liberty. ALEC apparently had a hand in one of the most high profile religious liberty fights to date. According to the Christian Science Monitor, three legislators deeply involved in ALEC had a hand in writing Indiana’s religious liberty bill in 2015, which then-Gov. Mike Pence gleefully signed. The fact that many large corporations protested vehemently against the law doesn’t seem to have bothered ALEC. In fact, it’s impossible to know just which corporations are members of the group, because it keeps such information private. However, in the past the group’s right-wing stands have caused some members to drop the group. ALEC was a proponent of Florida’s “stand your ground law,” and after the death of Trayvon Martin, corporations such as Amazon, Coca-Cola, General Electric, Kraft, McDonald’s and Walmart cut ties with the group. The exodus hurt ALEC financially at the time. Because of its secretive policy, there’s no telling whether the companies that left the group rejoined it after some time had passed. The real problem with ALEC is that it provides template legislation that is passed around multiple states. There’s no way of knowing that the plethora of religious liberty bills that popped up in state legislators this year had ALEC’s fingerprints on them, but it wouldn’t be a surprise. The participation of major corporations in ALEC should add a note of caution when it comes to celebrating corporate embrace of diversity. Ultimately, it’s the bottom line that matters the most. If ALEC can help that, businesses will be glad to sign on, even if there’s an anti-LGBTQ component to its overall agenda. What companies may be offering with one hand, they might be taking away with another. Thanks to ALEC’s secrecy, we just don’t know.